A new era of betting in Europe. Because current discussions of betting focus mostly on legal issues, one of the most successful new phenomena of the betting industry unfortunately remains largely overlooked. But the fact is that potentially betting exchanges are more likely to revolutionize the sports betting market in Europe than the Gambelli case. Betting exchanges are intermediaries in a person-to-person model (similar to eBay and Napster); they arrange bets between individual customers on an Internet platform. Their customers can act as traditional bettors, and they can also function as bookmakers. Thus, customers can offer their own bets and ask for better odds without having to have a betting license. And according to decisions of the first European legislature, the provider of the platform also does not need to have a bookmaker’s license. 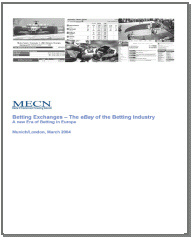 Industry experts predict that across Europe betting exchanges by 2008 will match bets totaling USD 159 billion. Based on their current (2004) volume of USD 16 billion, this would mean a CAGR of 79%. Betfair, the market leader, currently arranges bets worth an estimated USD 9.8 billion per year and realizes an annual profit (EBIT) of about USD 70 million.